After American in 3D in Quezon City last March and in Baguio in July. 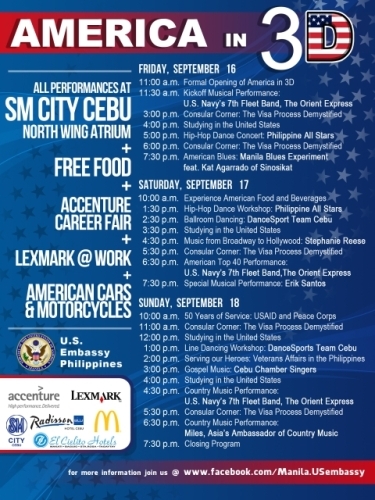 The U.S. Embassy is bringing America in 3D to Cebu City featuring variety of Events all are FREE and fun for the entire family. Events include Musical and Dance performances of American genres: blues, country music, hip-hop, Broadway, and modern day best hits. Free samplings of American food, information about US VISA Application and how to study in the United States, and sort of Resume Fair of American companies Accenture and Lexmark (will accept resumes for careers in their companies). America in 3D is open to all Cebuanos and friends, just come to SM City Cebu North Wing Atrium anytime between 10:00 a.m. and 9:00 p.m. from Friday, September 16 through Sunday, September 18. America in 3D brings you Performances from the following Musicians and Artists: U.S. Navy 7th Fleet Band - The Orient Express Band, Cebu Chamber Singers, Chef Gene Cordova, DanceSport Team Cebu, Manila Blues Experiment (Headed by Kat Agarrado, of “Sinosikat?” ), Miles - Asia's Ambassador of Country Music, Philippine All Stars hip-hop dance group, International singer & actress Stephanie Reese. American in 3D will highlight American culture, values, and services in the Philippines. Bringing the Embassy directly to the community. This is a unique opportunity for Cebuanos to meet many representatives of various Embassy sections, including the US VISA Section, the Department of Veterans Affairs, the U.S. Commercial Service, the United States Agency for International Development, the Foreign Agricultural Service, Peace Corps, and the Philippine-American Educational Foundation (Fulbright Commission). U.S. Ambassador Harry K. Thomas, Jr., and the other Embassy representatives will be available to answer your questions throughout the program. America in 3D is a personal initiative of Ambassador Thomas, this is the Embassy’s most significant outreach initiative. A nationwide initiative that takes the Embassy on the road throughout the Philippines in order to deepen the relationship between Americans and Filipinos. The U.S. Embassy in Manila is presenting America in 3D jointly with its partners: Accenture, Lexmark, McDonald's, SM City Cebu, Radisson Blu Hotel, and El Cielito Hotels. 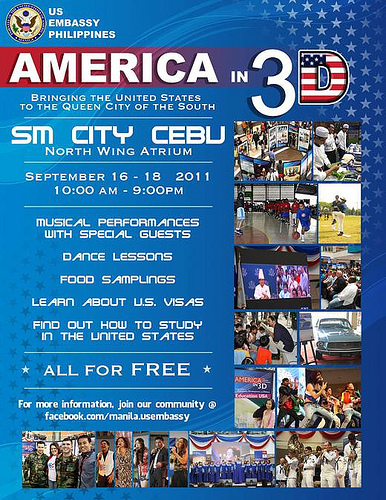 0 comments: on "U.S. Embassy brings America in 3D in Cebu City on September 16-18 2011"